NSLOOKUP is a basic command line utility for DNS queries, it’s built into Windows and should be a tool you’re familiar with. Here are some real world examples which I deem common queries. You may notice the non-authoritative answer, this simply means the name-server queried does not hold the entire zone for the domain (in other words it doesn’t have every single record)… more on that later. You can query another NS by appending the NS onto the end like the previous examples. If you have multiple records to lookup you might decide to head into interactive mode (see below). 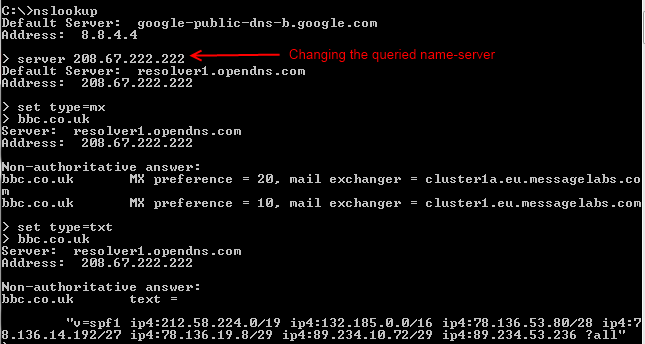 In interactive mode you can change the queried NS by using server 208.67.222.222. Remember I mentioned earlier about non-authoritative answers? 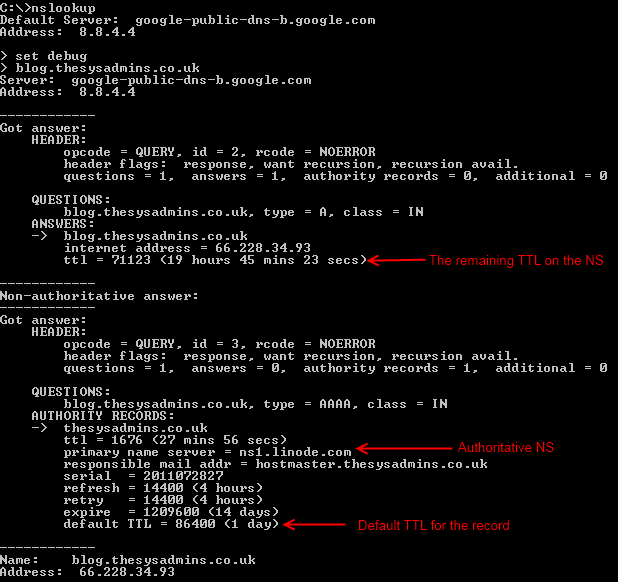 So, below what I’ve done is I’ve queried for the name servers for the bbc.co.uk and then queried them directly. 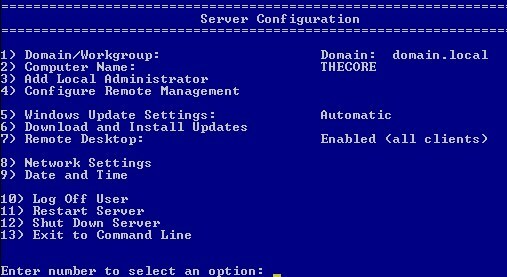 So your have your Core Server installed, now what? 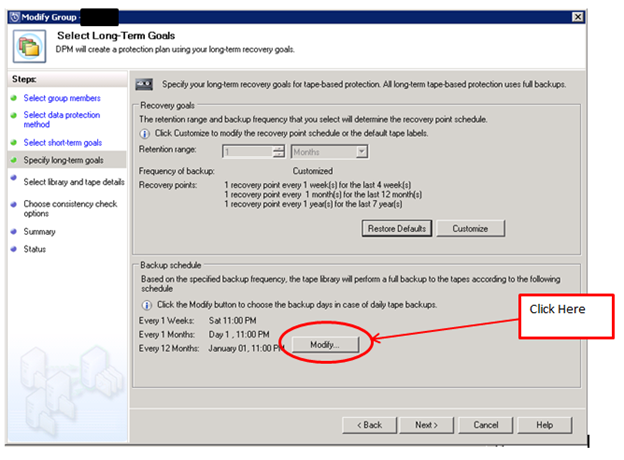 This post will give you some options for configuring your install. We’ll cover basic commands, Sconfig and 3rd party tools. Rename Server -> netdom renamecomputer oldname! /newname:newname! SConfig is built into 2008 R2 Server Core by default, and you can do a lot of the most common configuration tasks from here. It’s pretty straight forward and each step has on-screen instructions. Type sconfig from the command prompt. Server Core is Microsoft’s bare-bones version of Server 2008/R2, which was first introduced with Server 2008. Microsoft did a lot of work reducing the attack surface with Server 2008 by cutting down on pre-installed features and roles. Server Core takes a step further, resulting in an even smaller attack surface. There are less patches, which means less reboots so overall maintenance time should be reduced. Server Core has a much smaller footprint too, requiring around 3GB for a running installation. The traditional GUI that we’re used to seeing has been dropped and the ‘shell’ is nothing more than the command prompt. At first this might seem a little daunting for those used to the GUI but in part 2 I will talk you through common commands and some nice 3rd party GUI tools you can use to configure your installation. In this video we’ll look at installing Server core 2K8R2 into ESXi. The procedure is practically identical on VMware player and workstation. 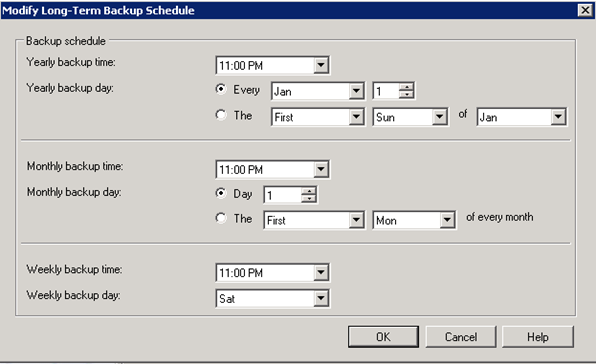 The main difference being instead of uploading the Server 2008 R2 ISO to the Datastore you will store it locally. Setting up a virtualized test machine/network is a great way of learning new technologies. ESXi and VMplayer are both free products from VMware which allow you to create guests, couple that with the free 180 trial of server 2008 R2 and you are good to go. 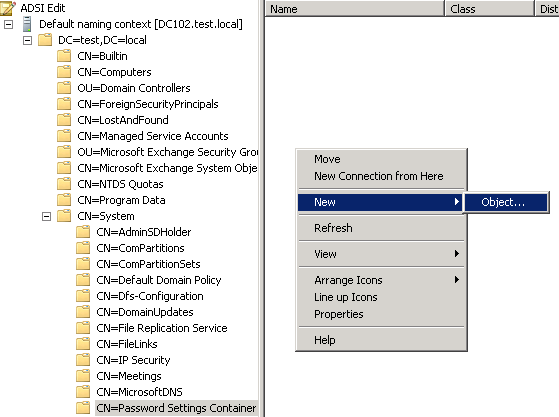 You can download the Microsoft Server 2008 R2 Trial ISO here. Once you have the ISO, upload it to your ESXi datastore, personally I always create an ‘ISO’ folder for dumping them into. If you are using VMware workstation or VMplayer you can store the ISO locally. In the following video I will perform a standard installation of Server 2008 R2 Core.